The thing about toxic laundry chemicals is when that laundry is worn we are essentially wearing all of those nasty chemicals and absorbing them through our skin. If you consider the preservatives in what many of us eat, the chemicals we bathe in and swathe on our bodies and hair (think soaps, shampoos, moisturisers, deodorants, perfumes, etc), the toxins used in our homes (like surface sprays, antibacterial wipes, air fresheners, hand washes, toilet sprays, cleaners), and the clothes we have washed in toxic detergents, you’ll start to get the idea that we are marinating in hundreds (maybe thousands) of chemicals like big toxic lasagnes (with legs)! Is it any wonder why infertility is at an all time high, rates of cancer are up (despite us knowing more than ever about cancer), obesity rates are higher than ever, respiratory illness is everywhere, anxiety and depression are everywhere, and so many other uncommon illnesses, diseases, and disorders are now seen every day. What’s worse is some of us are now going into our 3rd, 4th and 5th decades of life (and producing more life) in an environment that more resembles a toxic explosion than the simpler, lovely clean earth that our parents (and their parents, and grand parents) got to enjoy. My point (and the point of this whole entire blog) is that it is easily within our reach to minimise the chemicals that we use in our homes, on our skin, in our food, all to minimise the work our bodies need to do to in order to clean up after us. It’s not just for our sake, its for the sake of our health, but also the health of our families, pets, communities and the earth that we start to look at packaging labels and make better, informed choices wherever, whenever we can. 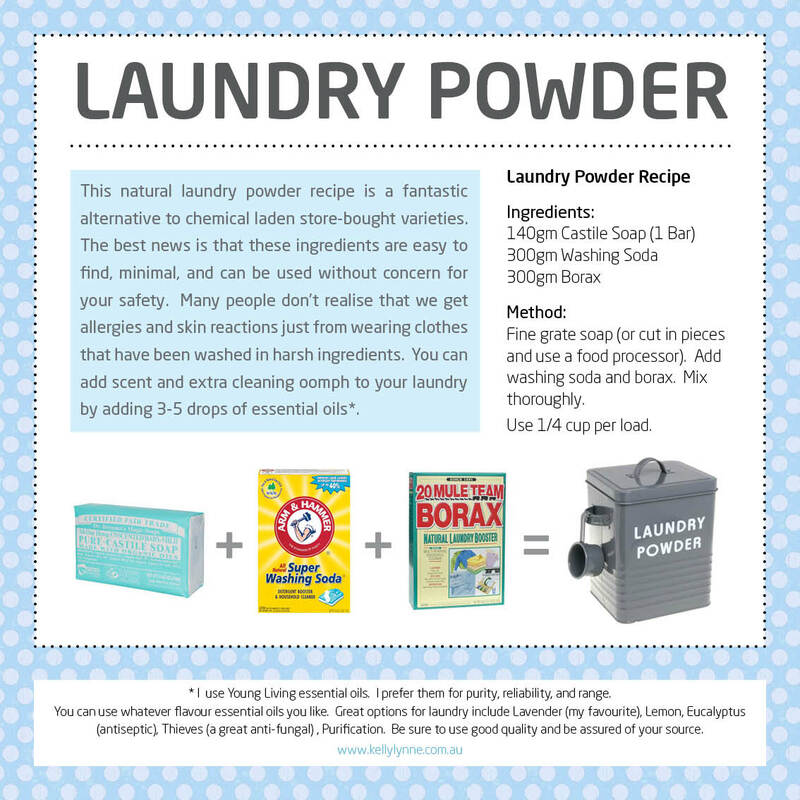 The best news is that better/best ‘non-toxic’ choices are readily available in supermarkets (I’ll expand more on better store-bought choices for laundry powder in a coming post) and they don’t necessarily cost more money. In fact some are the cheapest on the shelves! Yay to that! For 750g total batch (at 30g per 1/4 cup dose you get 25 washes per batch), so each load costs $0.39 cents. (If you use cheaper soap the per load cost goes down considerably). *As you can see the soap is the most expensive ingredient however Dr Bronner’s is one of the purest, best quality soaps in the land (it comes all the way from America… If we are in America we’d only pay $3, which really gives me the shits). Other pure soaps are available and much cheaper from homemade sellers and I’ll try one of those next time. If you don’t buy Dr Bronner’s then be sure to go for a pure vegetable soap with no fragrance (or other toxic or unnecessary nasties). Always check if there’s fragrance. If fragrance (or parfum) is present then don’t buy it. Ingredient Purposes: Castile Soap: Cleaning, Deodorising, Washing Soda: Water Softener, Borax: Whitening. You can scent your wash how you wish with 3-5 drops of pure essential oils instead. In fact you can do more than scent your wash you can also apply purpose to your scents by choosing certain essential oils. Lavender: Deodorising, Fresh, Calming, Thieves Blend: Anti-fungal, Antibacterial, Lemon: Antiseptic, Fresh, Purification Blend: Antiseptic, Fresh, Deodorising. Hi There, Thanks for your question. Managing a website like mine takes a little time to set up, after that it just builds with posts. I suggest googling WordPress for free (or inexpensive) templates where most of the set-up work is done for you. I also suggest linking up to facebook, instagram and twitter. There are also wordpress tutorials on YouTube too. I highly recommend these. Its a little study to begin with but it falls into place with some practice, trial and error. Good luck!